2nd Quarter: (M) Joe Plath 5-yard run, XP no good. 3rd Quarter: (F) Mike Luong 1-yard run, XP no good; (M) Aidan Sacco 68-yard run, Cincere Gill XP good. 4th Quarter: (F) M. Luong 2-yard run, M. Luong 2-point conversion; (F) Liam Foley 57-yard pass to Shayne Kerrigan, Russ Neale XP good; (M) Jack Mousette 5-yard pass to Khristian Conner, C. Gill two-point conversion. First OT: (F) L. Foley 10-yard pass to Brian Derba, 2-point conversion failed; (M) A. Sacco 10-yard run, 2-point conversion failed. Third OT: (F) L. Foley 9-yard pass to M. Luong, L. Foley pass to Rob Fay 2-point conversion; (M) C. Gill 3-yard run, 2-point conversion failed. FOXBORO, Mass. 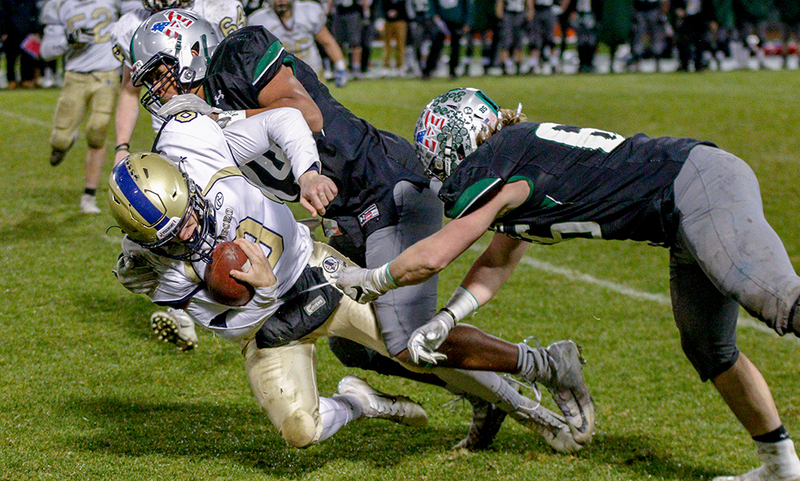 – After losing on a last second field goal and twice in overtime over the last three years, Canton was finally able to end its nearly three-decade-long jinx against Davenport division rival Foxboro and the Bulldogs did it in dominating fashion. 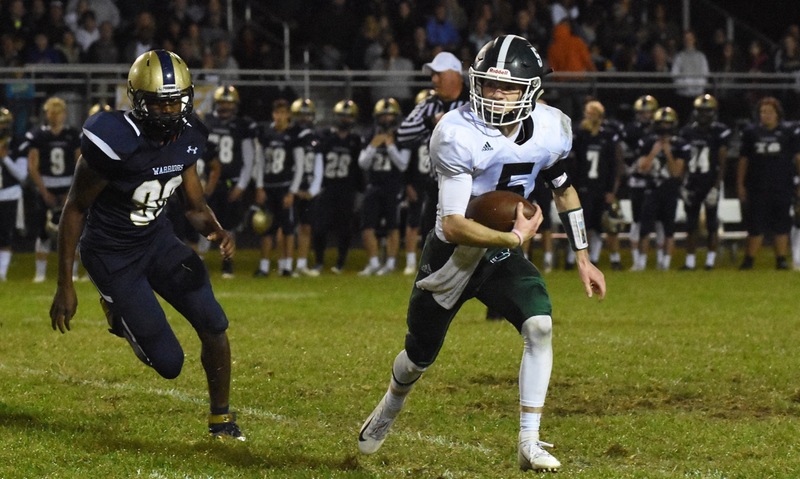 Junior quarterback Johnny Hagan accounted for 285 yards of offense and three touchdowns and Canton pulled away with a pair of fourth quarter scores to record a 43-20 victory over the Warriors on Friday night at Jack Martinelli Field. It was Canton’s first win against Foxboro since 1990 and ended a 25-game losing streak in the series. Canton also improved to 4-0 on the season, despite not yet having play a home game this fall. Hagan was a menace throughout the game, tossing a pair of touchdown passes in the first half and rushing for 175 yards on 15 carries. Martinelli admitted that his defense had no answer for Canton’s signal caller. Canton also benefited from dominant play at the line of scrimmage on both sides of the ball. The offensive line, which included Brian Campagna, Lucas Bryant, Matt Connolly, and George Kent opened up a number of holes for Hagan and running backs Gersom Rivera (10 carries, 52 yards) and Kyle Fitzgerald (11 carries, 68 yards). The Bulldogs jumped in front on their first possession. On third and eight, Hagan looked deep down the sideline to Jace Emma. The junior wideout leapt above the Foxboro defensive back and ripped the ball away. He then turned and sped upfield for a 75-yard touchdown that gave the visitors early momentum. Foxboro answered right back just four plays later. Mike Luong (12 carries, 70 yards) broke a 30-yard run, bouncing out to the right and getting into space on the sideline. Two plays later, Liam Foley looked for Rob Fay in the front corner of the end zone and the senior pulled in a one-hand catch to tie the game. This time it was Canton that responded. 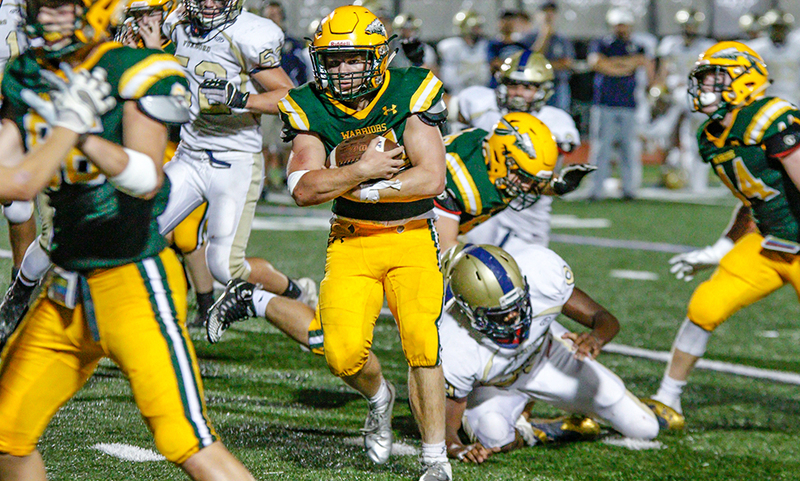 Hagan somehow got to the edge on another third and eight and raced 50 yards up the Foxboro sideline before being brought down at the Warriors 18. After another 12-yard Hagan keeper, Rivera punched it in from six yards out. David Allen picked off a Foley pass to end Foxboro’s next drive and then returned it 40 yards down to the Warriors 33. Fitzgerald needed only one carry to get the Bulldogs a two-score lead, taking a pitch to the left and finding a seam to the end zone. It looked like the game may get out of hand, but a special teams mistake by Canton, attempting to field a bouncing punt inside its own 20 only to fumble and have Zachary Jenkins recover, led to Foxboro having a short field. Keyshawn Sanders bullied his way through a bevy of tacklers for a 10-yard score that cut the lead to 21-14. Canton had one last chance with the ball before halftime. After an intentional grounding call, the Bulldogs faced third and 18 from the Foxboro 36. Emma ran a go-route down the near sideline and Hagan dropped a perfect pass to him in stride for a score with only 36 seconds left until halftime. Leading 27-14, the Bulldogs came out of the half with an impressive 15-play drive that ate up more than nine minutes off the clock. The Foxboro defense stiffened inside the red zone, but Owen Lehane booted a 27-yard field goal to make it 30-14. The Warriors didn’t quit and answered with a 75-yard drive. Foley rolled out and threw a dart to Brian Derbafor 27 yards and then a couple plays later ran a perfectly-executed backside screen to Luong for another 24 yards down to the Canton eight. On third and goal, another screen to Luong turned into a touchdown, but the two-point conversion pass was batted down by Allen to keep the lead at two scores with 9:09 remaining. After the Bulldogs went three and out, the Canton defense made the play that essentially ended any hopes of a Foxboro comeback. Brendan Albert crushed Foley as he was throwing and Robbie Gallery was on hand to secure the interception. He returned the ball to the one-yard-line where Hagan was able to get six points with a sneak. Fitzgerald added a nine-yard touchdown inside the closing two minutes to make the score even more comfortable for the Bulldogs. Canton (4-0, 2-0) will finally head home next week when rival Stoughton pays a visit to WWII Veterans Memorial Field. Foxboro (1-3, 1-1) will try to bounce back at home against two-time defending division champ North Attleboro.